Waste lot of time traveling and meeting the govt officials. Most Govt officials behave like they are from some other planet and inline with Gods. No kidding ! There is no clear information about the requirement. Not even the govt officials have full details. Govt websites are a joke. Usually there will be not enough information or it contain a language other than English such as some local state language which none from the other state understands. Even the Govt office boards does not contain English. This is very true except few places for example in Tamil Nadu where English is given greater importance over Hindi. You may need to pay bribe. Most of the laws are very old. Some dates back in the 1950s. How relevant is 1950s law in 2016 ? Just think about it. Okay sorry about the rant. When you purchase a new vehicle in India. You pay a life time road tax. That road tax is applicable to the state where you have purchased your vehicle. When move to a different state, you have to pay the road tax in the new state also. However, if you permanently move from one state to another, you can get a refund of your road tax amount from the state where you paid. House rent agreement – Registered document only (Notary house rent agreement is not accepted). Proof of date of transferring the vehicle. If you have transferred through packers and movers. Take a photocopy of it. Vehicle pollution certificate (PUC). You can get in Pune. Pollution certificate is valid for 6 months only. Cost is only around Rs: 35. Photocopy of Vehicle Registration document. Your vehicle’s invoice. This is needed to calculate your Road tax. Take surplus cash. Note the RTO office is all old school. They would not accept your credit or debit card. Reach RTO office by 11AM. Most officials only come by that time. Fill Form FT and get the imprint of your vehicle’s chassis details in the Form FT on the top right side. Get Form FT signed by the assistant RTO. Once signed, go to the place where you need to provide all your proofs to pay the road tax. The official will calculate the road tax of your vehicle. Your vehicle’s road tax depends on two factors: cost of the vehicle – Number of years old. If you vehicle is very old (say 10 years), the depreciation will be also high. Your road tax will be lower. Once you get the road tax amount calculated, you need to go to counter 23 and stand in queue and pay the amount. Patience: Lots of them. Prepare to wait in long line of queue. Respect: Yes pay respect to the RTO and sub officers otherwise you would not be able to get your job done. Yes very bad. Who said India is a democratic country ? Prepare to take plenty of water and make sure to eat well in the morning. You certainly don’t want to stand for hours with your empty stomach. Take plenty of cash and lots of change. When you enter the Road transport Office (RTO), you will be greeted (I want to put it nicely :-P) with a horde of agents. Just don’t notice them. Go to the parking lot and park your vehicle. My Vehicle’s number will be changed ? No. You are only paying road tax and not De-registering your vehicle from the original state. What about NOC (No objection certificate)? NOC is not required if you are going to stay temporarily in Pune. Is there any catch ? Yes. Legally with this Pune road tax you can only drive for an year (from the day you brought your vehicle). If you want to drive after that, you need a no objection certificate from the Road transport office where you have brought your vehicle. With the above steps, you can pay the road tax without involving any agent or paying bribe. 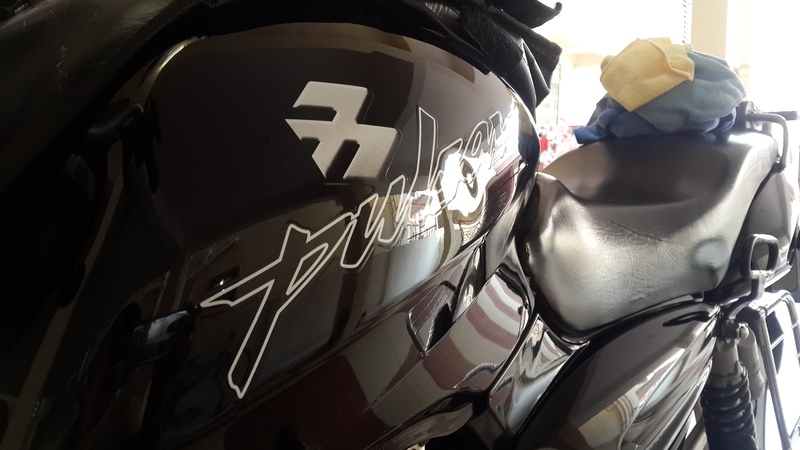 After seeing lot of praise for the Valvoline 4T premium 20W50 for the Bajaj Pulsar. I wanted to try the same. As you can see, Castrol is 20W40 and Valvoline is 20W50. 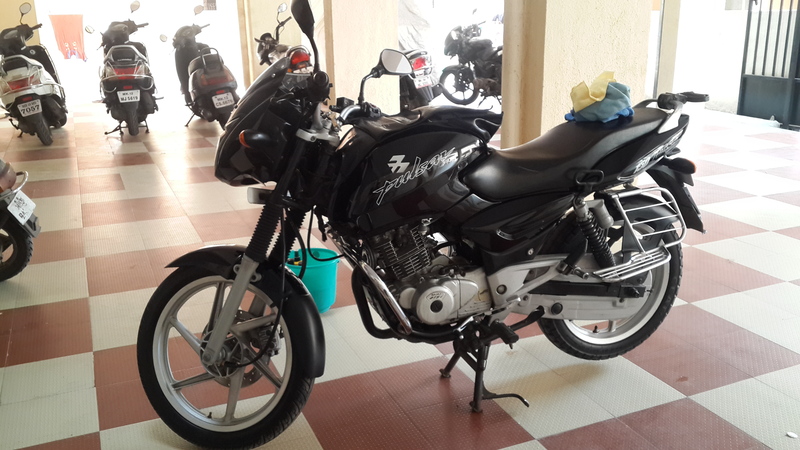 Bajaj recommends 20W40 for my 2006 year model hence I have used this oil for all these years. Newer Pulsar needs 20W50. Nevertheless, 20W50 is any day superior over 20W40 when the engine encounter high heat. 20W50 oil retains viscosity over 20W40 during high engine temperature. For a decade I have only used the Castrol 20W40 4T oil. I thought that was a good oil but after trying out Valvoline, I really see a noticeable difference in engine smoothness. Many say the Valvoline is best suited for Pulsar motorcycle. I have used an engine flush while changing the oil. – Engine sounds harsh. Also it is just 20W40, so not suitable for extensive touring where the engine encounter lot of heat. + Slightly longer draining period. Many say around 2500 KM. – Oil evaporation is very high than the Castrol. I have refilled 250ml oil onto the engine. I am glad I have bought two cans of the oil. Light is very important right from cleaning your vehicle till the completion of detailing. However we should not clean our vehicle under direct (midday) sun and while apply detailing products. If you have no option but to clean and detail your vehicle in open space, best time is morning and in the evening. Look at this wheel. This car was parked in a closed space with limited lighting. It does not look very dirty. Now I took another photo with flash and see the difference. There are quite lot of dirt. Alloy wheel, Tire and tire wall are having lot of dirt. So it is important to do the cleaning and detailing activities under proper lighting conditions. In general, don’t use pressure washer. Water would seep into electricals and engine. Don’t wash your vehicle during mid / hot sun. Soap solution would dry very soon before the removal. Also not in the dark it would be hard to locate the dirt. Don’t apply too much wax. Apply just a thin layer of wax. Don’t apply wax when the temperature is very low. Removal can be difficult. Unlike other products, you should let the wax dry on your vehicle’s surface so that the removal is very easy. 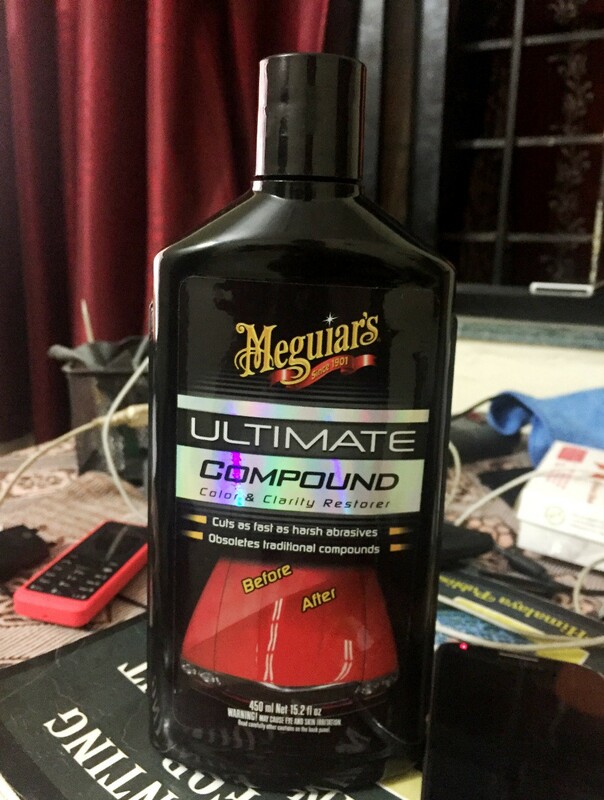 Meguiar’s Ultimate compound is a great abrasive. It is used to remove scratches from your car / bike’s paint.It is still clear coat safe. I have recently used it on my bike and the results were great. My bike was not properly maintained for the last 9 years. 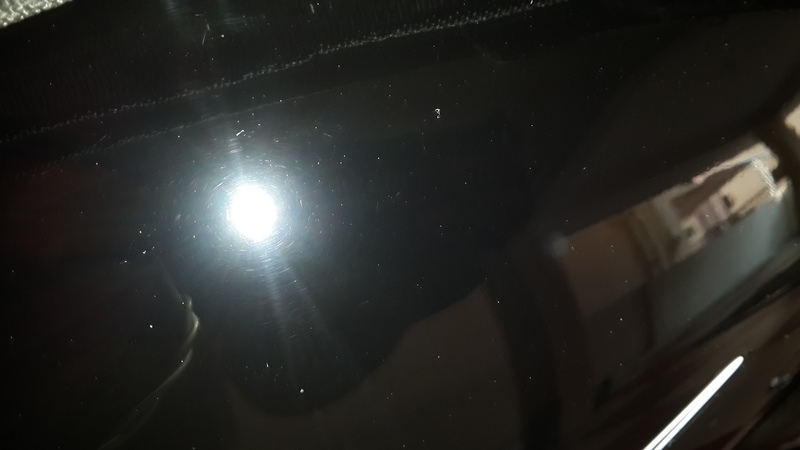 Hence it has quite lot of scratches, swirl marks, oxidation etc. Application was done through hand (manual). 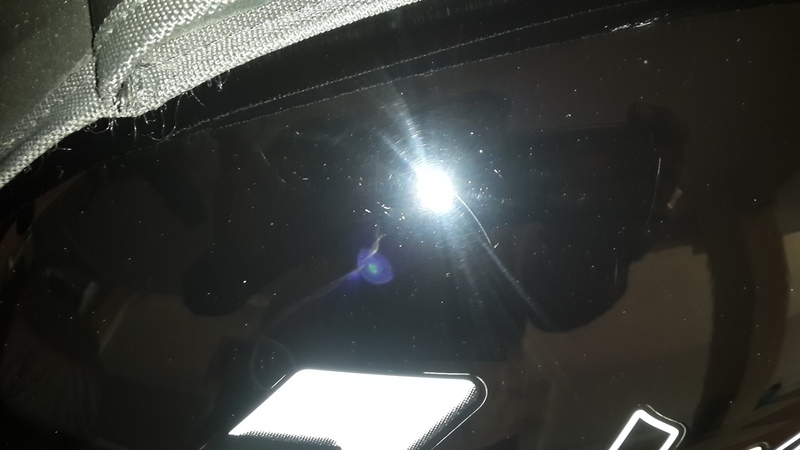 After the application of Ultimate compound most scratches are gone. There are some deep scratches still there which hope will be removed after few more application of this amazing product. Clay application is one of the most important part of detailing. Clay decontaminates your vehicle so that it gets its original gloss. Unfortunately Clay is super expensive. This is true atleast if you are not in US or UK. I have a cheap clay alternate solution to counter this. 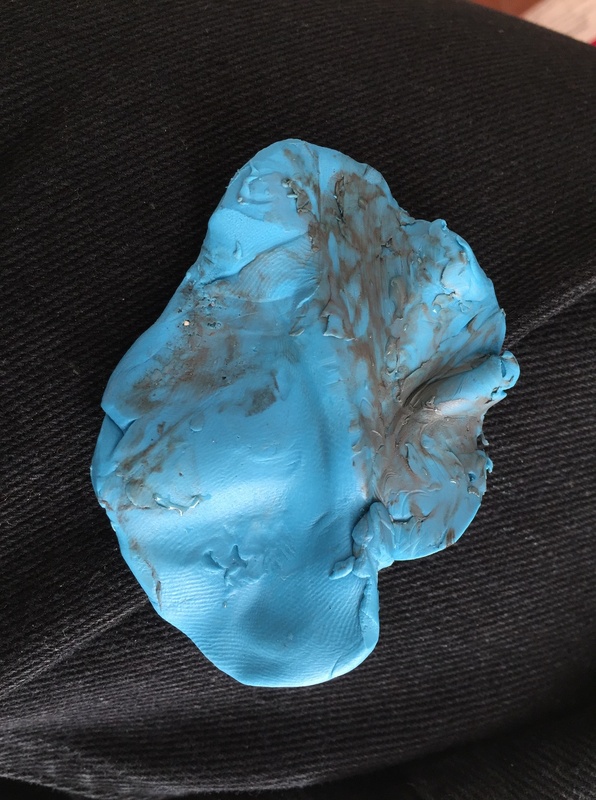 It is modelling Clay. 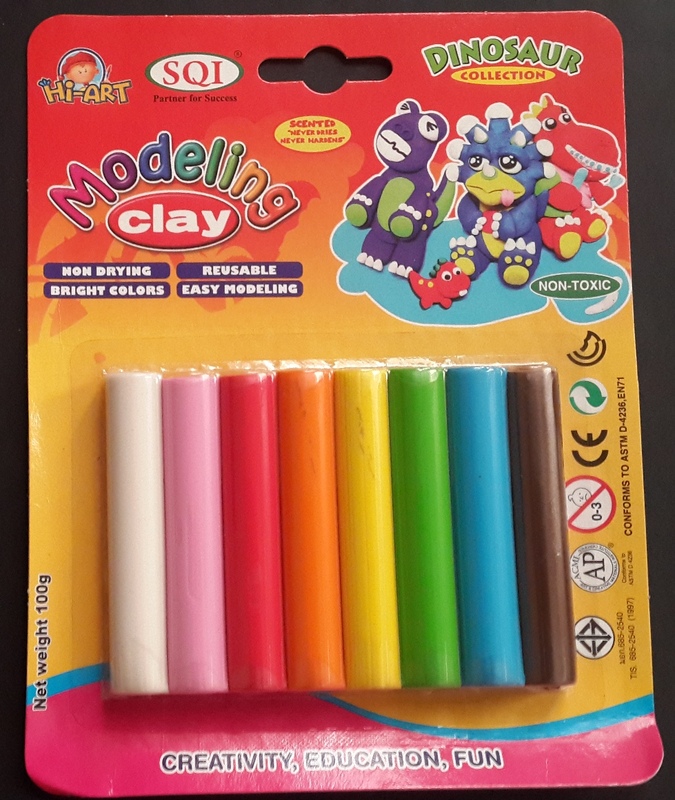 Modelling clay is available in toy or stationery stores. You can buy a pack for around Rs 50 which is less than 1 US $. Proper Clay from Meguiar’s or other brand costs upwards of Rs: 3000 or more. That is a lot especially when you drop a clay on the floor, you have to through it to a dust bin. This one is made in Thailand. There are around 8 modelling clays in this pack. I taken the blue one and tested it on my bike. I have made the clay flat and I have misted Meguiar’s quick detailer on vehicle’s surface. You can use clay on glass, paint and even wheels. Look how dirty the the disk brake components. Clay just picked up quite lot of contaminants from the Disc area. Caution: Don’t use clay lube on Disk space brake area. I just used it on places where you can see the bolt that holds wheel and the disc. I have kneaded the clay again and used it for the wheels. If the clay gets lot of dirt, it is time to throw it out. Step 2 is to Clay (to remove contaminants) and remove scratches. Step 3 is to polish. Step 4 is to wax. Step 5 is maintain the shine. This blog is not updated for the past 4 years. I am planning to give a new lease of life to this again. However, now the contents will be entirely different altogether. It will be automotive only but more into detailing and real physical stuffs. I am not doing this photoshop thingy anymore. I have removed many of the unwanted things (links, gravator etc) from the blog. Still lot needs to be removed and refined.